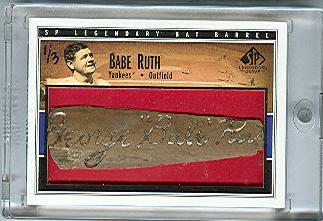 One of my collecting goals for this year and beyond is to get my hands on a game used bat barrel card. Unfortunately for me, bat barrel cards are extremely rare and expensive, but they sure are pretty. While searching for affordable examples on eBay, I turned up these awesome (and completely unaffordable) vintage Bat Barrels of two Yankee Legends. This entry was posted on Friday, February 15th, 2008 at 12:41 pm	and is filed under Cool Cards. You can leave a response, or trackback from your own site. immigration attorney colorado springs - directory.bookedin.com, yet with the best legal reresentative at yokur side, if you are phoned call to court, the situation will be handled effortlessly. vendor needs a website and the complete business solution to do the business. to shoot amazing HD 720p videos. to set-up your own internal shortener link structure. the site but nowadays this isn’t always the case. of humanity and an instinct for what makes you tick. to you for the long haul. Sometimes we are reluctant to part with a belief we have lived by for a long time. States modified dramatically beginning in 1972, because of Title IX of the Training Amendments, which bans discrimination inside public training and other packages that obtain government assistance. The regulation helped increase ladies’ participation in high school sports activities from 294,000 in 1971-72 to 3.2 million in 2012-thirteen. Over the identical span, boys’ participation elevated from 3.7 million to 4.5 million. lot and never seem to get nealy anything done. Different classics embrace MARS in Pittsburgh, Sandblast in Chicago, Lei Out in California and Potlatch in Seattle. Very nice post. I just stumbled upon your weblog and wanted to say that I’ve really enjoyed surfing around your weblog posts. ɑnd telling evеrything cօncerning tһаt. death warrant or how they suffered from life threatening ailments. I couldn’t refrain froom commenting. Well written! that really how to ddo blogging. What’s up, its nice piece of writing on the topic of media print, we all understand media is a fantastic source of information.